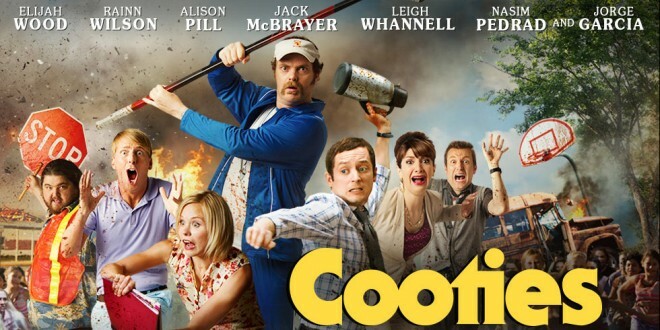 “Cooties” (2014). Directed by Jonathan Milott and Cary Murnion. Starring Elijah Wood, Alison Pill and Rainn Wilson. Contaminated chicken nuggets cause a zombie outbreak in an elementary school. It only affects children. I hope your health insurance covers cootie shots! At a chicken farm, near the town of Fort Chicken, a zombie nabs a chicken and kills it. A fly lays eggs on the chicken carcass (no it doesn’t turn into a zombie chicken, although that would’ve been hilarious) and even though it’s writhing with maggots, the dead meat is sold. It’s processed and made into chicken nuggets that are sold at a school cafeteria. Seeing how bad public school food is, this doesn’t surprise me. A kid, Shelly Linker, bites into the contaminated chicken nugget and black goo comes out. Mmm-mmm! It’s nutritious and delicious! In Clint’s class a brute named Patriot (he was born on September 11th and wants to be a marine…Yeah. Great parents there) bullies Shelly, and when he pulls on her ponytail, it comes off with part of her scalp. Ewwwww! Shelly attacks Patriot, scratches some people and the zombie outbreak begins. The infected kids start attacking the school staff. It’s carnage in the halls! The only people who survive the attacks are teachers. They run and hide in the library, where they find Calvin, one of the kids that hasn’t been infected yet. Calvin says they got cooties, because Shelly had them and gave them to everyone. But, Shelly scratched Clint during the initial attack, and he didn’t turn into a zombie. Interesting. The teachers argue about what to do, and if they could make a run for their cars. Clint thinks that they’re too fast, and that the zombie kids would kill them before they could make it. While this is going on, Patriot smashes all of the confiscated cellphones. Drat! And here they were thinking that saving money on the school budget by eliminating land line phone service was a good thing. Now how are they going to call for help? Lucy, another teacher, suggests that they wait in the classroom until 3pm, when the kid’s parents will come to pick them up. Then they can go to the roof and shout for help. Good idea! Unfortunately, the soccer moms that come to pick up their kidlets don’t really pay attention and let the infected kids into their cars, and are then attacked and eaten. Oops. The science teacher dissects the brain of one of the infected kids, and discovers that the virus that causes the cooties zombie outbreak only affects pre-teen kids that haven’t started puberty yet. Thanks science! Circle, circle, dot, dot now you have a cootie shot. The town is being evacuated, and they are left to fend for themselves. They have to fight their way to a truck and get the hell out of dodge. Will they make it? If you can’t guess, this is a zombie apocalypse of kiddy proportions. 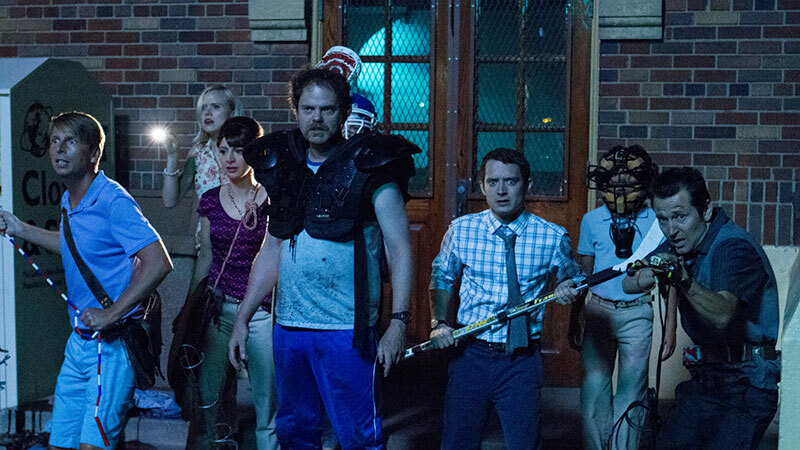 It doesn’t look good for the teachers, and this horror comedy has a rather bleak ending. The rest of the country is overrun so I have no idea what they’re going to do to survive. I’d tell you more, but I don’t want to ruin the good jokes that come in at the end of the film. No Mr. Frodo! Don’t go outside! The Ring Wraiths ate the chicken nuggets and they’re going to give you cooties. Tagged Clint, Cooties, cooties shot, horror comedy, infected chickens, zombie kids, zombies.